Served in old-fashioned glasses, and topped with whipped cream and a cherry, these are just like the shakes I remember from when I was a kid. I recommend the Cookies and Cream. So good! Guests love Whispering Canyon Cafe for the amazing all-you-care-to-enjoy skillets at breakfast or supper time, as well as the crazy antics of the staff. (Don’t be surprised if you witness — or participate in — a stick horse race around the restaurant.) 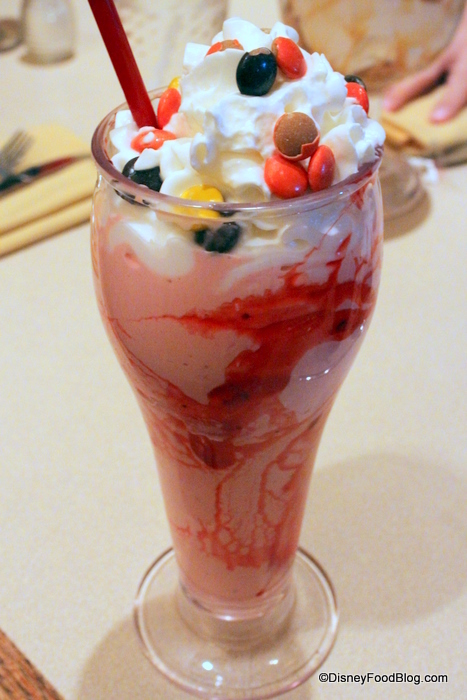 But another beloved menu item at Whispering Canyon are the Bottomless Milkshakes. Served in a jelly jar (another fun throwback to childhood! ), they come in your choice of vanilla, chocolate, or strawberry. They’re garnished with sprinkles and a thick cap of whipped cream. And they’re truly — no-joke — all-you-can-drink! Get as many refills as you want! Want to know something fun? They’re on the menu at breakfast, lunch, and dinner! When it’s time for some good comfort food and I’m in Disney’s Hollywood Studios, no one does it better than 50s Prime Time Cafe! With a slightly bossy staff (keep your elbows off that table!) 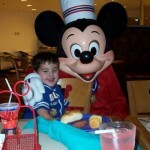 and awesomely kitschy decor, this is one of my favorite spots to dine in all of Disney World. But they are also well known for their delicious Peanut Butter and Jelly Milkshake. Made with a heaping helping peanut butter and grape jelly, it’s a fun new way to enjoy these classic favorites. And this one comes to your table in the metal blender cup — also a fun touch! Get it to go at Tune-In Lounge next door! If you can’t make it to 50s Prime Time today for your PB&J Milkshake, you can always make it yourself with our handy recipe! Head to Sci-Fi Dine-In for Disney Imagineering at its best. You’ll dine under the “stars” as you watch clips of hilarious mid-century B movies. Seating will be at a picnic table, or maybe even a vintage convertible! All-American fare like the Picnic Burger make for fun meal options. 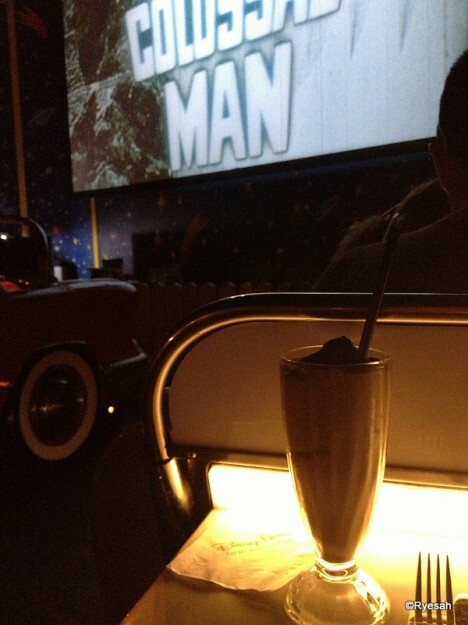 But some of the best surprises at Sci-Fi are the milkshakes! And the cool thing here is that you can choose from traditional shakes, like the Oreo Milkshake. Or if you’d like to take it up a notch, you can order a grown up version with alcohol. 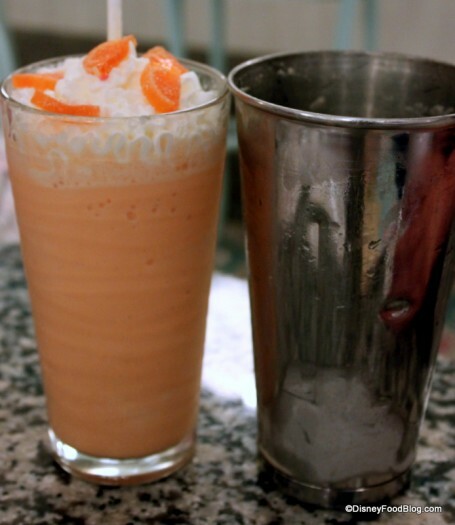 Fun choices include Marsha’s Martian — a chocolate or vanilla shake mixed with Bailey’s Irish Cream and Kahlua. Or try a Space Monkey, a chocolate shake that includes Malibu Rum and Banana Liqueur. If you’d like to stick with the awesome Oreo milkshake, have an Orbiting Oreo with Godiva Chocolate Liqueur! 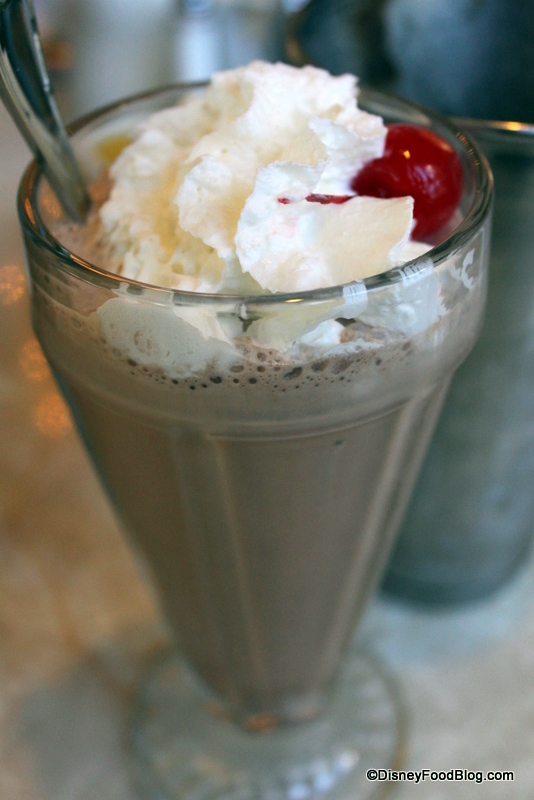 Another excellent spot for creamy, old-fashioned milkshake goodness is Beaches and Cream Soda Shop. Beaches and Cream is an awesome spot for Burgers, and I absolutely love their Grilled Cheese and Tomato Soup! But when it comes to milkshake time, I recommend their Malted Milkshakes. I’ll have chocolate, please! If you’re looking for something lighter, try the refreshingly wonderful Frozen Sunshine. This one’s a favorite of DFB columnist Heather Sievers! This bright orange frozen drink is made with orange sherbet and seltzer water for a frothy beverage with a hint of bubbles. It’s a great alternative to other milk-heavy options. 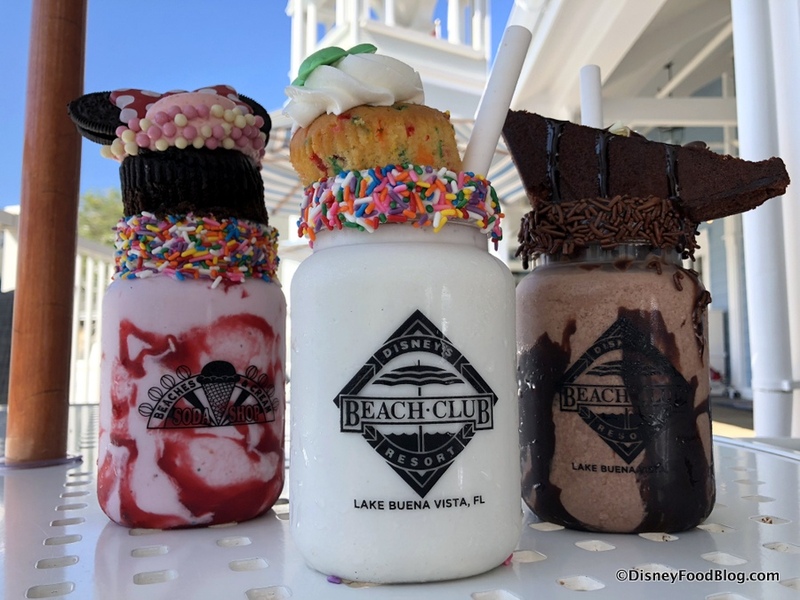 If you want to enjoy a Beaches & Cream milkshake that’s not so classic, you’ve got to indulge in these loaded, over-the-top milkshakes that come topped with — seriously! — a whole cupcake or wedge of brownie! Get yours in chocolate, strawberry, or vanilla, and don’t forget to grab yourself a spoon, a stack of napkins, and maybe even a fork! Head over to Walt Disney World Swan and Dolphin Resort for the next entry in our food challenge: PB&J Milkshake, Part Two at The Fountain! I love this spot for old-fashioned soda shop goodness and comforting food. Their chili cheese fries are not to be believed! 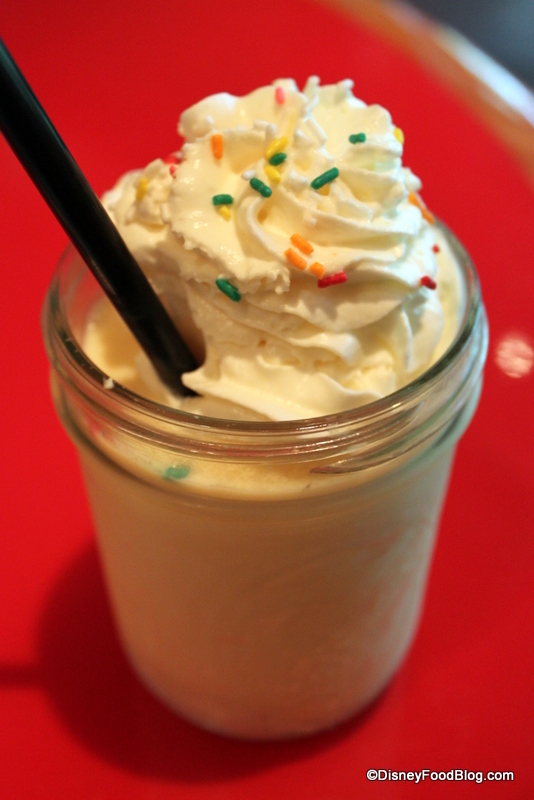 And while the PB&J Milkshake at 50s Prime looks sorta vanilla-y, this one is a complete showstopper! It’s served with a bright red drizzle of strawberry sauce that turns it delightfully pink. And topped with Reese’s Pieces, the peanut butter flavor is fabulous, too. Unbelievably thick and rich, this is just as fantastic as it looks. 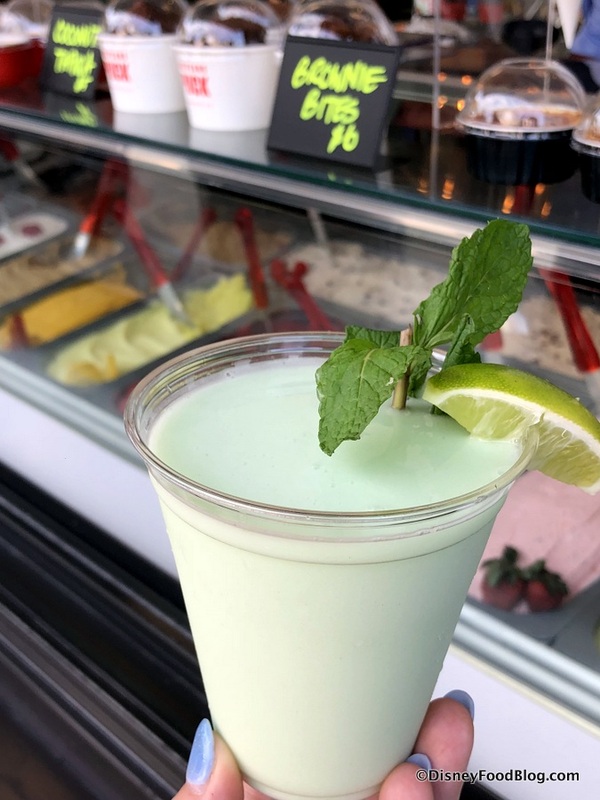 Wolfgang Puck Bar & Grill in Disney Springs made a big impression when it opened in late-2018, and one of the more intriguing options coming out of the restaurant’s Gelato Bar is the Key Lime Sorbet Margarita — a grown-up milkshake, if you will. 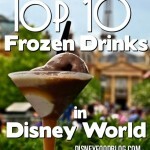 I loved this, and the only reason I’ll skip it on my next visit is so I can try the other three adult sorbet beverages on the menu! Finally, when you’re ready to lounge by the pool and enjoy an icy drink, head over to Hilton Bonnet Creek and stop by the resort’s pool bar, Beech. Enjoy the views of the beautiful pool and lazy river, and order the Frozen Hot Chocolate! Made with ice cream, milk, and real hot chocolate, the flavor is deeper than a normal chocolate shake. You have to try this one! And there you have it! This is the most fun you will ever have getting your daily dose of calcium. We recommend you buddy up for this dairy-rich challenge. You’ll still have more than enough to enjoy! 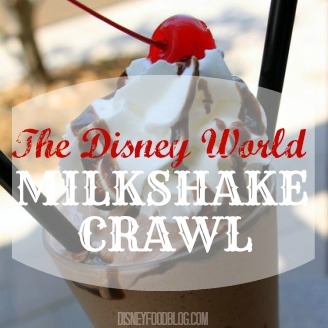 Will you be taking the Milkshake Crawl Challenge? Leave us a comment below and tell us your favorites! Oh, without a doubt, I have to pick the PB&J as my favorite. Love that you don’t have to eat at the Café, you can just pick one up at the Tune-In Lounge. Great post! 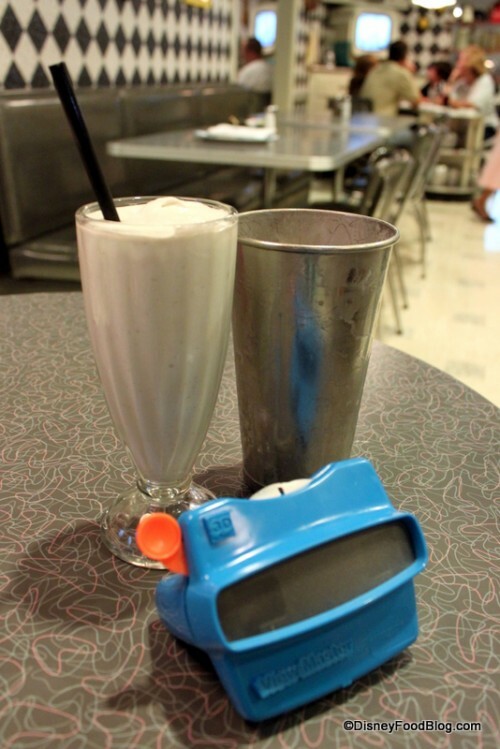 Best milkshakes I’ve enjoyed were at All-Star Sports Resort. They are made with great care and pride as I like it. Tough to walk by when there is no line. I recently spent 4 days at Dolphin and could not believe the lines for the Fountain so I missed out. Best part is knowing I will be back down again next year! When I want to blow a bunch of calories in an “I don’t care” moment, I’ll belly up to the bar so to speak at Beaches & Cream for a milkshake and fries!!! Oh Yeah!!! Whispering Canyon Cafe has a Caramel Bottomless Milkshake that is awesome. It is one of the additional flavors they offer that is not listed on the menu. Wilderness Lodge. Any flavor will do for the moment. Mybe chocolate. 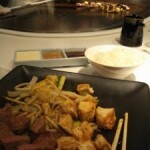 Second choise, The Plaza Resturant for me. But not the Cookies and Cream. But anyone will do for me. Vanilla. Wow! Now I’m seriously considering trying out The Fountain in December instead of a visit back to Beaches & Cream. I enjoy Beaches & Cream, but the waits can be a killer. Sounds like The Fountain (after reading more about it in the linked post) might be a perfect alternative. I like to think that I invented the No Way Jose milkshake at Beaches & Cream (chocolate ice cream, chocolate syrup and peanut butter fudge), so everybody go order it and make it be a thing! 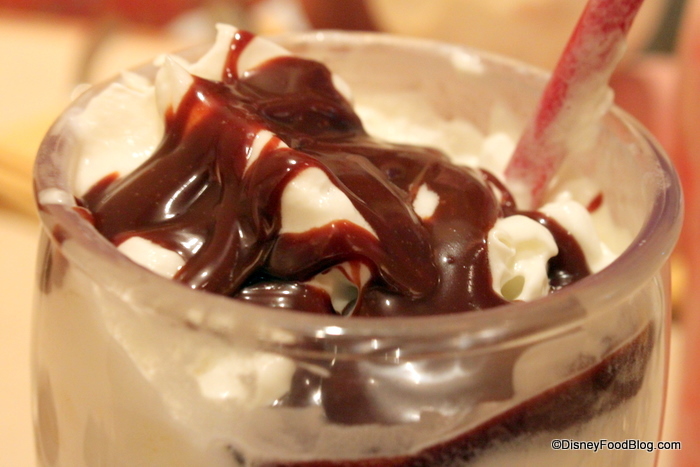 However, an even better version of this can be made at Ghirardelli by ordering a shake with their (Ghirardelli!) chocolate ice cream, chocolate syrup and peanut butter sauce. They’ll make it nice and thick if you ask, too! We stopped by The Fountain before a couples massage at Mandara Spa last trip. I has the PB&J milkshake which was rich and peanut buttery. The strawberry gives it more color than flavor. It was quite good if you enjoy peanut butter (whcih I do). My wife got an apple pie sundae which was baiscally a sundae built atop a giant slab of apple pie with carmel drizzled everywhere. The pie itself was nothing to write home about. But topped with ice cream and carmel, it was delish. Have you ever thought of hosting a crawl? Maybe not something death-defying like an afternoon of milkshakes, more like a favorite snacks of World Showcase or something. Cost free, just get together people and go. Yummmmm! My semi lactose intolerance would hate me for doing this crawl, but how can I possibly say no to that?! Oh, milkshakes are food from Heaven. I love chocolate malteds. But, so many of these that you featured look and sound so wonderful, that a crawl has to be on a future trip list; I just won’t bother with any meals. We love the milkshakes at Port Orleans French Quarter, too… available flavors are basically traditional, but WOW are they well made :)! I plan on going to Disney the first week of December. 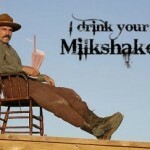 Responding to Galloping Gourmand’s post, if anyone wants to join me for a milkshake crawl, I’m game! I’ll definitely be doing this crawl on one of my days there, and I’ll post a full review of each when I return. I’ll do my best to compare them to each other, but it’s always tough when you’re not eating them side by side. Thank you AJ for these great crawl ideas, I love them! Sorry but there is a huge miscarriage of justice…where is the Ghirardelli ????? It is my favourite milkshake on the planet!! 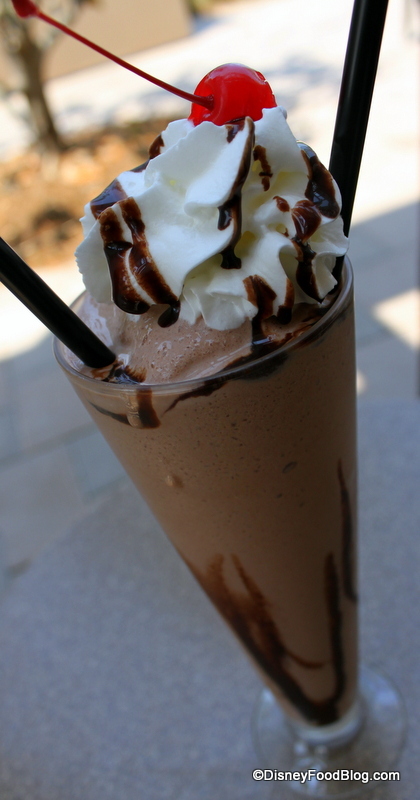 And I have sampled MANY chocolate milkshakes in my years and theirs are the very best. Chocolatey, but not too sweet, thick and creamy. I have several shakes every trip. Have to agree with Claire, although I suppose they’re not “Disney” milkshakes in the strictest sense since they’re available elsewhere. We NEVER go to WDW or California Adventure (or San Francisco or San Diego) without getting a Nob Hill Chill. It’s pretty much the best thing ever. We’ve been known to get several per trip. Can’t walk past Ghirardelli in DTD without going in. It’s impossible! I had a great milkshake at Planet Hollywood. It was mint chocolate, and the portion was huge! My husband and I shared it before our meal. 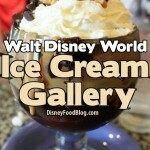 I love EVERYTHING about beaches and cream, but my dad esp. loved the frozen sunshine. One of his favorite things there.